When one hears of elliptical machines with motorized strides and 25 resistance levels, one immediately fears a massive price tag. However, Schwinn has managed to pack in these features, along with a number of other useful and value-adding ones, to the Schwinn 470 Elliptical Machine. Though slightly costlier than the Schwinn 430, this elliptical machine boasts of updated technology and more features at a price tag which is far better than that of its competition. Keeping up Schwinn’s reputation for excellent quality elliptical machines, the Schwinn 470 comes with an ergonomically designed frame similar to the one found on the Schwinn 430 elliptical machine. However, the10 degrees ramp on the Schwinn 470 elliptical machine is motorized, as opposed to the manual ramp on the 430. This allows the ramp incline to be changed using five quick keys on the elliptical machine. This makes adjustment of the incline far smoother than what it is on the Schwinn 430. Like other Schwinn machines, the 470 also comes with mechanisms which improve the balancing of the machine during heavy workout. These mechanisms include two integrated levellers and a central crossbar support. Interestingly, Schwinn has also provided the elliptical machine with oversized crossbar tubing for increased support and stability. Like the Schwinn 430, the Schwinn 470 comes with a 10 year warranty on the frame which is decent for the price range, though perhaps not as decent as the same warranty in the Schwinn 430′s price point. Warranty for the electrical parts is 1 year, while that for the mechanical parts is an equally good two years. The 90 days warranty on labor may appear slightly on the low side at first sight, but we should remember that Schwinn offers the same warranty on most of its products. Finally, the Schwinn 470′s structure includes 25 resistance levels, which can be changed using five dedicated buttons. Not only does this compare favorably with the 20 resistance levels available on the Schwinn 430, but it is in fact one of the best in its price range, and tends to justify the slightly higher price point of the machine. Further, the resistance is created using magnetic eddy currents, which ensures that workouts are smooth and virtually noiseless. User weight capacity on the Schwinn 470 elliptical machine is a good 300 pounds, which is the best offered by an elliptical machine in this price range. The machine weight, on the other hand, is 231 pounds, which is slightly higher than that of the Schwinn 430. However, the higher weight can perhaps be explained by the fact that while the Schwinn 470 elliptical machine has a motorized ramp, the 430 has a manual ramp. In practical terms, however, the difference should not be a major one since the Schwinn 470 also comes with wheels underneath it which can be used to stow away the machine safely once it the exercise is complete. One of the most important parts of an elliptical machine are the handlebars, since they provide the much needed balance and stability to you when you are exercising. Schwinn provides both moving and static handlebars which have grip heart rate monitors. This means that your grip itself is the measure of your heart rate and you do not need to use any other specialized equipments to measure it. Further, like the Schwinn 430 and 470 models, a technology called BioFit has been used, which ensures that the handlebars are ergonomically designed for ease and comfort. This is especially noticeable in the moving handlebars which have an angled design for an easier grip. The other parts of the Schwinn 470 elliptical machine are the flywheel, the speakers and the fan. Thespeakers are quite loud, thanks to the acoustic system found in Schwinn’s machines. The three speed fan is the standard provided in Schinn’s machines, and is quite efficient without being too loud. The elliptical machine has a perimeter weighted high inertia high speed flywheel that combines the best of stability and speed to provide you a smooth and hassle free workout. The elliptical machine comes with a 20 inch stride which is more than sufficient for most exercise enthusiasts. Add to fact that the ramp is motorized and you realize that this elliptical machine has one of the finest. The footplates of the Schwinn 470 elliptical machine are quite large, which allow them to maintain the most essential feature of any elliptical machine – the contact of the feet with the surface while working out. Like the Schwinn 430 elliptical machine, the Schwinn 470 elliptical machine offers a dual LCD display, which can provide up to 13 different exercise metrics at the same time without reducing the size of the display size to atomic levels. Sweetening the deal further, Schwinn has provided the dual LCD displays of the Schwinn 470 with blue backlighting, so you can see the metrics clearly even when it is dark. Further, the control panel has 29 programs, which makes it the best elliptical machine in this price range when considered in terms of the number of programs available. Even better, it offers four user defined profiles, which is double the number offered on the Schwinn 430 elliptical machine. 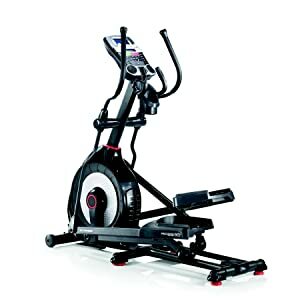 Schwinn also offers the SchwinnConnect feature with the Schwinn 470 elliptical machine. SchwinnConnect allows you to export your data or upload it to myfitnesspal.com. Either way, this helps you keep track of your fitness goals wherever you go, and allows you to continue pursuing your goals on a different Schwinn machine. Schwinn is well known for taking good care of its customers, and the 470 is no exception. It offers cushioned footplates and handlebars to ensure that your arms and legs don’t feel uncomfortable when working out for long hours. Add to these the stability offered by the twin levellers and large flywheel and you can appreciate why Schwinn 470 elliptical machine is rapidly gaining popularity. Schwinn 470 Elliptical Machine knows that a higher price demands more features, and therefore, it has improved the feature list by including a motorized ramp, more programs, blue backlit feature on display and double the number of user profiles. These more than justify the price difference with the Schwinn 430, and tend to make it one of the best elliptical machines in the below $1,000 price range.